In the year of celebrating its 50 Years of Nationhood, Malaysia tries to attract more Korean tourists to their country by communicating their culture and tourism advantages with two things: Food and golf. "In 2006, a total of 186,000 Korean tourists visited Malaysia. This is still a very small number compared to other Asian countries like Thailand," Mr. Mohd Rosly Selamat, chief operating officer of Pempena SDN BHD told The Seoul Times on March 2, 2007. Pempena SDN BHD is wholly-owned subsidiary of Tourism Malaysia. Mr. Selamat is visting Seoul to promote Malaysia's golf among South Korean people. With simultaneous growth of middle class and golf industry, golf tourism is one of the keywords in Malaysia's effort to attract more foreign visitors. Golf has established itself as a form of corporate game, where the big deal lies mostly in the sense of meeting people instead of solely concentrating on the game itself. Many important decisions are rather made on golf courses than in corporate offices. "One saying is, that in the office you are talking about golf, and while playing golf you are talking business," Mr. Selamat said. Especially in Korea golf is booming, and many Koreans are willing to travel, in order to discover new and exciting golf courses. A discovery they are very likely to make in Malaysia. "In order to promote our numerous golf courses, we have created the Malaysia Buzz Program. You can buy a membership for 10 years and get unlimited access to our golf courses. Among the most beautiful are the courses on the Island of Langkawi along the South China Sea and the golf course at the Mines Resort City, which is situated around a lake, which used to be the world's largest open cast tin mine," he explained. Another advantage of Malaysia is its climate. With a temperatures range from 21 to 32 °C all over the year, it's possible to play golf at any times. "In Malaysia you can play golf 365 days a year. We even provide special night courses for people who aren't able to play during day," Mr. Selamat pointed out. Another way to attract more tourists to your country is by promoting its traditional food and cuisine. People who like to eat in restaurants of a special country, get introduced and interested in that country's culture through that restaurants special atmosphere and interior. That makes them more likely to travel to that country as tourists. "People say that you can win the heart of a man through food. I think the same can be said about the man's thinking of a country," he went on. Malaysian Restaurants play a big role in this strategy. They have to communicate a part of traditional Malaysian culture through their interior, customs and staff. "What we are trying to do is, suggesting to the restaurants to arrange their interior in a traditional Malaysian way. In return we offer them help in terms of advertising and communication," he explained. Another important role plays a phenomenon called food tourism. Tourists are traveling the world in order to taste many different kinds of food and cuisine. As Malaysia consists of numerous different states, all with different influences and thus different forms of cooking, it offers a great variation of different tastes. "Malaysian food is very special, because it's a mixture of all different kinds of Asian food. It's some kind of fusion food, which you can't find anywhere else in the world. We are trying to use public places to promote our food and its highlights in special events," Mr. Selamat added. There are some similarities between Malaysian and Korean food: they're both spicy and diversified as well as healthy. "I love Korean food. Actually Malaysian and Korean food get along very well together. 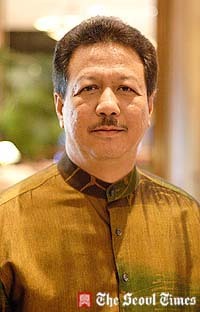 That's why I think we should have earlier opened Malaysian restaurants here," Mohd Rolsy Selamat finished.